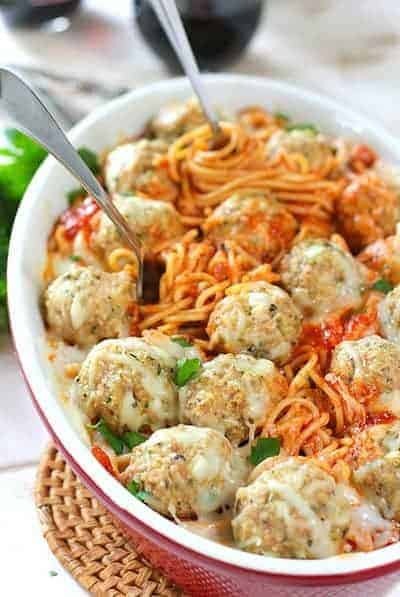 This fabulous baked spaghetti with chicken parmesan meatballs is one of my all time favorites!And that says a lot! The recipe is semi-homemade, so it saves you some time, but gives you all the flavor of all home made. Delish! Do you remember that show called ‘Semi-Homemade’ with that really pretty blonde lady? Not sure if it’s still on but this recipe is kinda like that. You use a few store bought ingredients along with a few fresh ones. It’s a little bit country and a little bit rock and roll…no wait, thats Donnie and Marie…there goes my age showing again! This recipe combines a few of my faves. Chicken Parmesan Meatballs and Baked Spaghetti. At first I thought, who would wanna make a spaghetti casserole? Why not just serve it up from the pan without tossing it in a casserole dish? Why dirty one more dish? Becaussseeee, this makes a big old batch and you can serve it out of said dirty casserole dish for days! Not to mention the flavors become all beautiful while baking. So totally worth the extra dish! This recipe got me through at least four episodes of Scandal with noodles to spare! You use a jar of good marinara for the sauce which really cuts down on the prep time. I bake the meatballs rather than sauté in a pan. Line your sheet pan and no clean up! Cook some pasta…toss, top with cheese and you have dinner for days and maybe even an extra Scandal episode on Monday! Use a good jar of marinara. The better the sauce, the better the casserole. I used Roasted Garlic from Trader Joes but there are plenty to choose from at your local grocer. 12 ounces of pasta is perfect for a 9 x 9 casserole. Just eyeball it…using 3/4 of a box. It’s so tempting to throw that whole pound of pasta in but trust me, your casserole will come up dry. If you must use the whole pound of pasta, increase the marinara and use a 9 x 13 dish. Ground chicken is very available these days but ground turkey will work just great. Stay away from the ‘all breast’ meat kind. Rather dry. Now if you are still looking for a big old pot of something to make on Friday so you can lay back and enjoy the weekend. Give my Italian Sausage and Mushroom Soup a try! 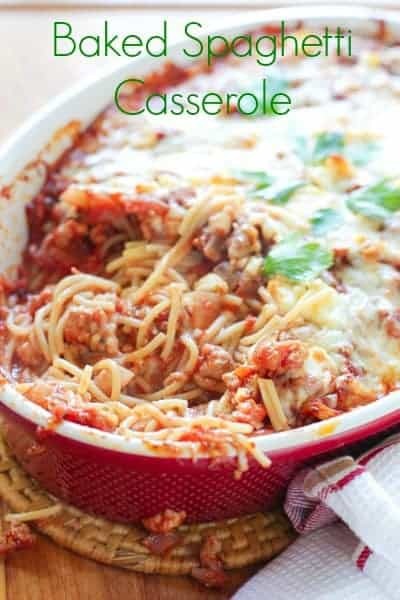 This yummy casserole is a great way to get your spaghetti and meatballs on the table! Line a baking sheet with foil or parchment for quick cleanup. While water is coming to a boil make meatballs. 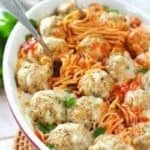 Add all meatball ingredients to large bowl. Gently combine until just mixed. (over mixing will make for a tougher meatball). 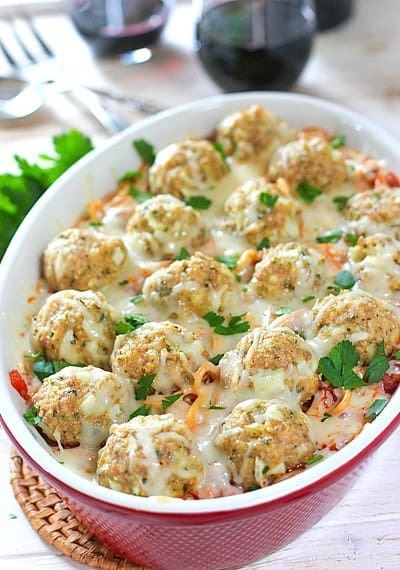 Shape into 2 inch meatballs and place on lined baking sheet. Bake for 10-12 minutes or until cooked through. Drain and return to pan you cooked the pasta in. Combine pasta and marinara sauce. Pour into 9 x 9 casserole dish. Bake for 20-25 minutes or until center is hot and bubbling. Bake an extra 5 minutes. Team Fitz or Team Jake? Love everything about this recipe! Baked spaghetti and Chicken Parm Meatballs. Yes Please! Well this looks (and sounds) fabulous! Pinned! BTW – haven’t seen scandal, but I’ve been binge watching Downton Abbey — guess I’ll have to make this and settle into the couch with a chilled white! Some day gonna go to Vegas and see that Donnie and Marie show before they start doing it in their walkers! ha ha! First of all, your photography is gorgeous! I love the idea of making one big thing on Friday to free up your weekend time. I love this idea. Thanks for the recipe! Oh my gosh you are so sweet! I so struggle with my photography so I really appreciate the comment! One thing I really remember about Sandra Lee, the “Semi-Homemade” hostess was that she always enjoyed a cocktail on her show! I am all in for one dish meals, and I think that taking a store-bought product and putting one’s own personal twist on it is a great idea! So this one’s a winner in my book. It’s the kind of dish you bring to the table and everybody just digs in. My family will be enjoying this one soon. Thanks Adri! Yes, it was Sandra Lee! She is so pretty and love anyone who enjoys a cocktail! 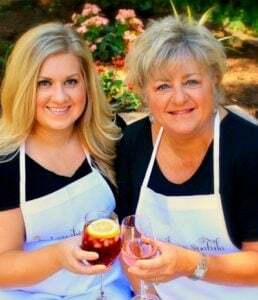 Clink!